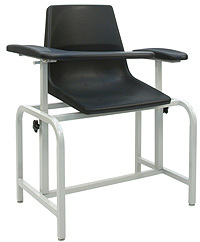 Our Top Selling Blood Drawing Chair- Economical and extremely sturdy. A clean simple look with easy set up with only 4 screws. It's up and running in less than 10 minutes. Fold-up armrest has a quick release so that the armrest can swing up to allow room for the patient to sit down and then back in for a comfortable sturdy fit. Both chair arms heights are adjustable with screw type release and push button lock. Also comes with adjustable non-marring leveling feet. This item is shipped in one box, with the body of the chair as one solid piece and the black seat separate. Set up is easy using only four screws to attach the seat to the body. This chair is solid and sturdy. Inexpensive shipping within the Continental U.S.
Armrest adjustable height 27" - 37"